ARE YOU READY TO CLIMB? 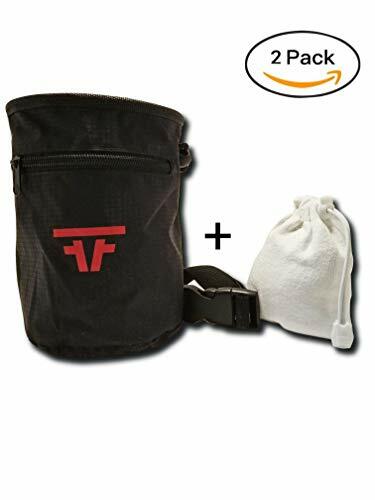 This premium Chalk bag made with water resistant material is the perfect chalk bag. With a 2-Zipper design you can hold your phone and all your valuables while you climb! Chalk bag comes with a FREE 2oz refillable chalk ball so you don't have to waste money on buying one separate. Chalk bag thats Perfect for Rock Climbing, Weightlifting, Bouldering, Gymnastics and Crossfit. Comes with easy to use quick clip belt with caribiner on the back. 2 Pockets for storing large valuables. Store your ID, keys, cards, Large phones easily (iPhone 8 Plus/Galaxy S9). Keep all your valuables on you at all times. Large main compartment for chalk. Spend more time maneuvering through difficult spots, not struggling to get your hands in the bag. Adjustable draw cord closure closes completely to prevent chalk spills. Keeps your chalk in the bag and not on the floor. Premium Quality Water resistant material. Suitable for both Men and Women. Backed up with our lifetime guarantee. Satisfaction or your money back. Order Now. If you have any questions about this product by Free Face Gear, contact us by completing and submitting the form below. If you are looking for a specif part number, please include it with your message.